Athlete Tommy Grant rounds the bases during a recent baseball game this spring. The Saints spring sports season is heating up as the grounds dry out. College of St. Joseph drew a crowd at several home games this week, with both baseball and softball earning victories. The Lady Saints defeated Fisher College in an away softball doubleheader. Despite a strong start at the top of the first inning by Fisher’s Jayla Vega and Mikayala Zimmerman, the Falcons were unable to hold off the Saints. Vega took the loss for the Falcons, giving up eight hits, two walks, and striking out three as the Saints defeated Fisher 6-2 in game one. The Saints quickly took the lead in game two, and by the bottom of the fifth, the Saints had scored five runs on a double, single and a three-run home run, gaining a 14 run lead. Fighting Saints baseball came up short in a home doubleheader against Fisher College, dropping two games. The Saints lost game one 12-1. Sander Vargas, Devin Perry, Dominic Zaher, and Cody Mercier led Fisher with a combined nine hits and eight RBIS. Late in the sixth inning, the Saints made their only run on an RBI single by Tyler Kunzmann. The Saints fought for a comeback in game two with Alan Madsen on the mound. The Saints were unable to push past Fisher, in game two with an 8-6 loss. The Saints baseball team lost to Saint Michael’s College in an away doubleheader, with game one ending 6-2 and game two 9-5. Alan Madsen was charged with the loss in game one, lasting five innings, walking two, striking out two, and allowing three runs. Two runs in the sixth helped the Saints close the lead before Saint Michael’s scored three runs in the sixth. John Coppola did his best to give the Saints a rebound in game two, but was unable to hold off Saint Michael’s, ending in a 9-5 loss in seven innings. 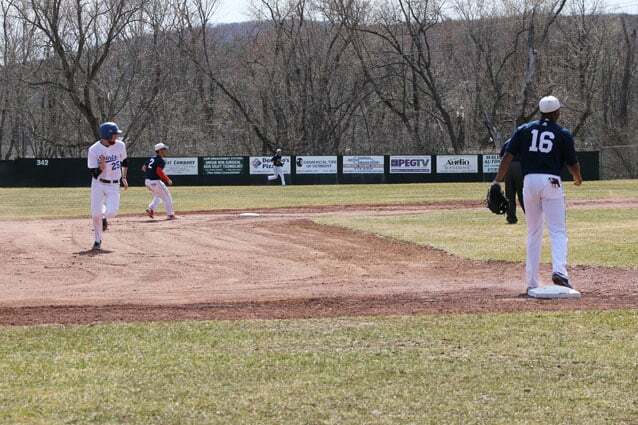 Fighting Saints baseball defeated Central Maine CC in home doubleheaders on Sunday. The Saints scored five runs in the sixth of game one, led by Jayson Osborne at the plate. Tyler Kunzmann kept damage to a minimum on the mound, retiring 11 Central Maine batters, allowing one earned run, two hits, and one walk over six innings. The Saints kept that momentum in game two, as Ryan Cummings earned at no-hitter with a final score of 19-0. The Lady Saints fell to Johnson State in a home doubleheader on Sunday. Game one ended 5-1, and game two 15-5.